Planets with craters are just 'black holes' - bug? every Planet that should have craters are just black dots in the universe, and planets which are part rock (for example mountains and etc. )are just only Waterplanets,- the mountains are simply not loaded anymore. The problem occours since my new graphics card made an auto-update. I tried everything, for example just to install my old graphics card driver, or to reinstall Space Engine all over- several times. I even tried to solve it by installing older visions of Space Engine, or to install add-ons that should override the old datas. Even by installing SpaceEngine over another Server didn't work- and the problem did't vanish. Everytime I start SpaceEngine by the 'new earth', it's just a big waterball without any landscape. I searched through the Internet, and it seems that some have the same Problem, but no one has figured out yet how to solve it. 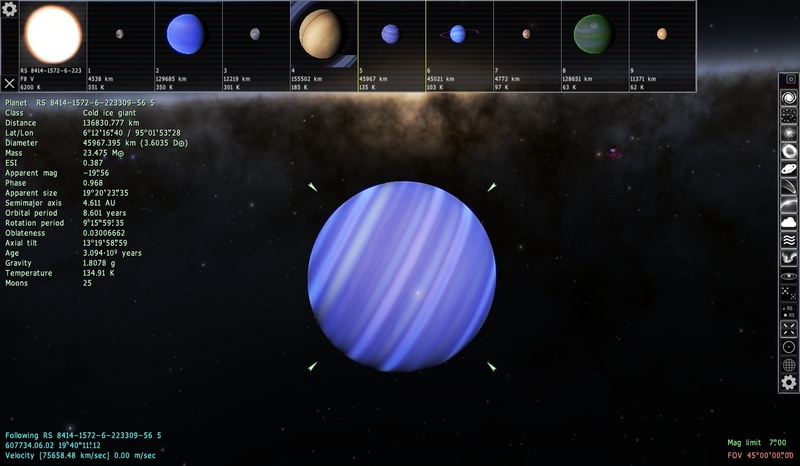 Please help me, so that I can enjoy SpaceEngine again without this nasty bug. I attached a screensshot of the black dots where the 'crater Planets' should be. lycot, please read the forum rules before posting. Attach your se.log so we can see if there's anything weird in there. What graphics card do you have? Ok, HarbingerDown- I moved my question to the troubleshooting tread. Sry, for that. The Information which graphics card I have is added there, too. PS: What do you mean with se.log?